As this was my first time using a tunnel tent I was rather excited that I might actually be able to lie out straight in it, which is a bonus when you are 6’2”! 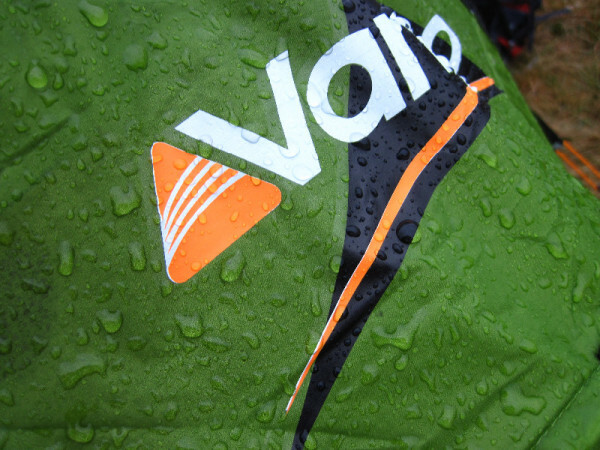 A few months ago I was giving the opportunity to test and review the Vango Spirit 200+, which on first impressions looks like a great tent for use while camping in the UK. This is my first time using a tunnel tent and I was quite excited because I might actually be able to lie out straight in it, which would be a big tick for me because I’m 6’2”. 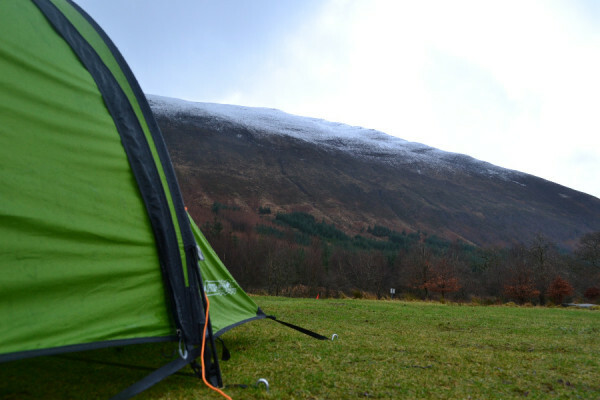 It is not uncommon for me to have to curl up in a ball to fit in some tents, thankfully with the Vango Spirit 200, this was not the case. The first thing that I noticed when I unpacked and rolled the tent out was just how long it really was. 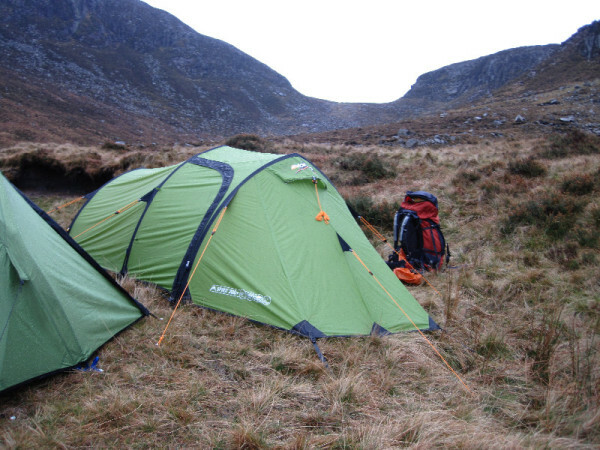 Bear this in mind when you are searching for a spot to pitch, as you really do need a bit more space than the average tent. 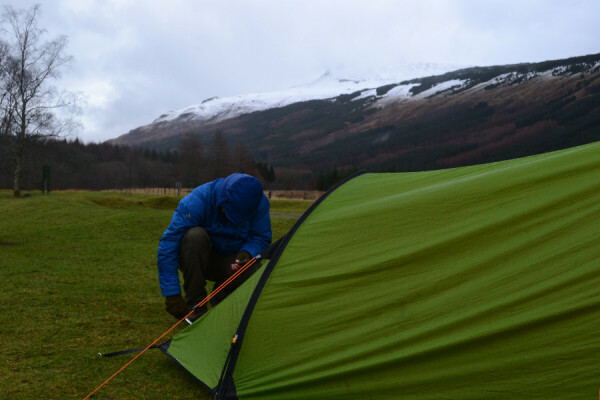 Pitching the tent is pretty easy, I’m able to do it by myself in under ten minutes and the inner comes pre attached to the outer – which was a nice surprise and helps speed the process up, along with keeping the inner dry while pitching. The inner tent attaches to the outer with plastic clips and elasticated tape which means the elastic stretches and absorbs movement, saving the tent fabric any stretching. The inner tent hangs away from the outer giving circulating air plenty of space to flow around the tent and keep condensation at bay. The poles are colour coded making it easy to figure which poles go in which sleeve. 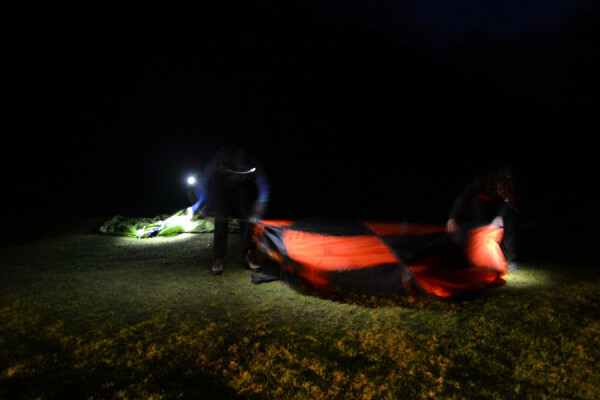 Especially useful when pitching in the dark or in a hurry because of weather. One thing to note is the pole sleeves can be a bit tight when pushing the poles through and another hand would help out a lot here, but it is still possible to do on your own. The reason for this is that the pole sleeves are flat which make the fly sheet more streamlined so the wind doesn’t catch on the pole sleeves. Once I got the tent up I couldn’t believe the size of the porch, it’s huge, plenty of room for rucksacks and boots thus keeping the inner tent clean and free of mess. Even with all your kit in the porch there’s still a lot of space for cooking and getting in and out. You could even fit a bicycle in the porch it is so big, although it may be a bit cramped. On a recent trip to Scotland the extra large porch was a life saver. Before going to bed I would organise my belongings so everything was in arms reach, which meant I wouldn’t have to leave my warm sleeping bag in the morning. 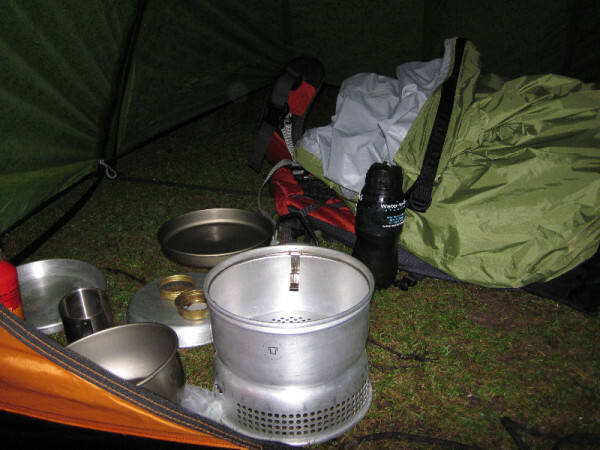 I’d have my water collected for my porridge and coffee, and my Trangia at hand, ready to light up. 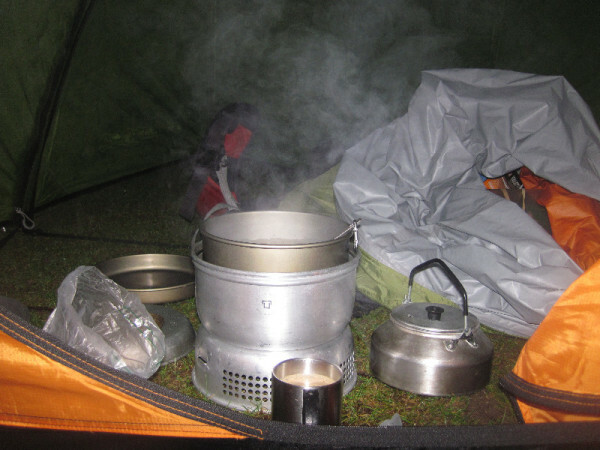 When you sleep in the tent I’d recommend sleeping with your head at the door, so in the morning you can simply open the inner door up and reach out to get a brew on and start cooking from the comfort of your sleeping bag. When you are in the porch you will notice the Tension Band System (TBS). 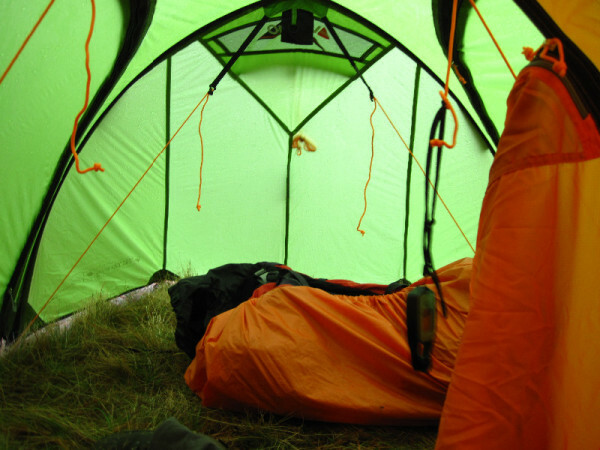 The TBS is an internal set of guylines that provides extra stability to the poles by connecting them to the bottom straps of the tent. 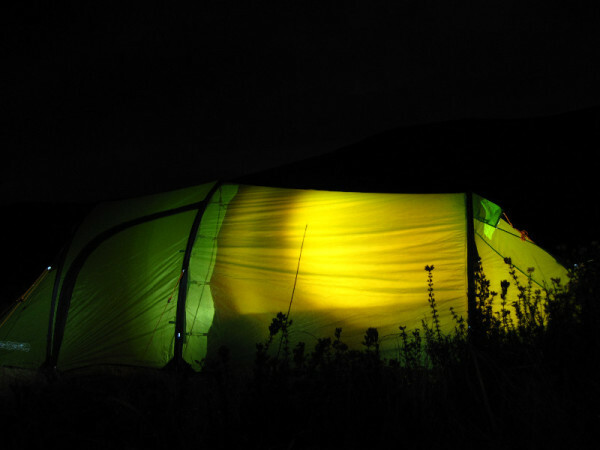 This connection stops the tent from shaking about as much in stronger winds and will help stop the flysheet from being pushed inwards and touching your face throughout the night. The design of the tunnel tent means that the sleeping compartment will be taller at the porch end and will slope down towards the feet. This lets the wind pass over the tent with greater ease. The inner sleeping compartment also runs into a central point at the end, giving you some extra foot room if you lie in the middle instead of the sides. I was able to lie in the center of the tent, flat on my back, and not have my feet pushing the inner onto the outer of the tent, something that would usually happen when you are 6’2″. This has allowed me to get the best nights sleep in a tent I’ve had for awhile and for that reason I’d rather not share this tent with anyone else. This problem wouldn’t happen unless you are rather tall, two smaller campers could sleep in the tent and would have no problems fitting in. A nice little bonus was the row of pockets lined down the sides of the tent, which gives you plenty of storage for all your essentials during the night. Overall I really like the design and features of this tent. The extra space is brilliant for those who are taller than average and for anyone who needs the room to store kit. For solo use I’d love to have the Spirit 200 without the massive porch, just to save a bit on weight and pack size, but for two people sharing the weight (3.10kg) the 200+ would be prefect. You get so much tent for the weight and with that extra porch area the inner can be mostly clutter free. Having seen this tent for myself I definitely concur as to the size of the porch - it's a monster of a porch, handy if you fancy cooking breakfast before climbing out, or if you have a lot of kit. 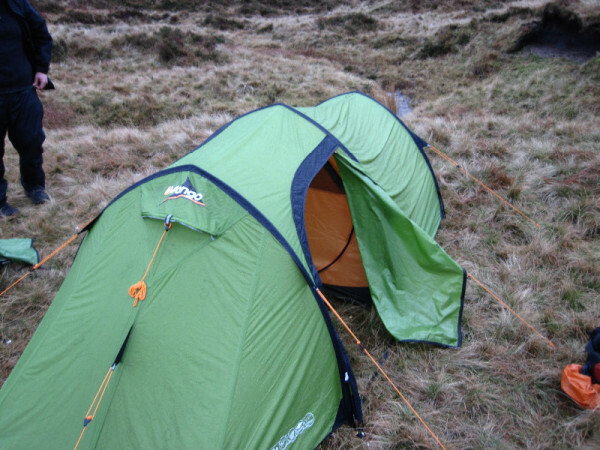 This is definitely my favourite two man tent, even though I'm 6"1 I have had comfortable nights with another person in there, although as you rightly point out using it alone is much better. I like the side porch feature, it's so easy to get into and out of and it makes storing your kit much easier.